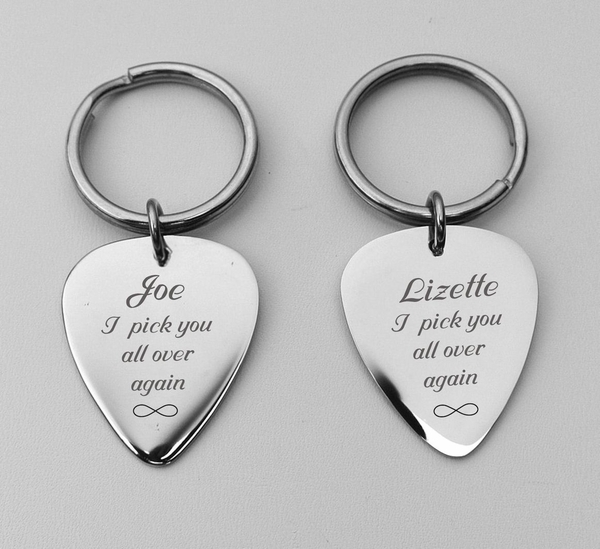 Personalized Guitar Pick Key chain set. This high polished stainless steel durable key chain is personalized just for that special person, offers a thoughtful and practical gift for all occasions. Pendant measures 1.250 "W x 1.250"H.
The guitar pick is made from a high polish 316L Stainless Steel treated with Chromium for extra protection which gives them a cool reflective shine. This corrosion resistance keychain can be personalized with the name or text choice. Great as a gift to someone special.